Printed by J M Kronheim & Co. about 1855 for publication by The Religious Tract Society in their book "The Christian Wreath." It is accompanied by a description of "The City of the Sultan." Constantinople was at the time capital of the Ottoman Empire, having previously been the capital of the Byzantine Empire. It stands on the west end of the narrow channnel of the Bosphorus. 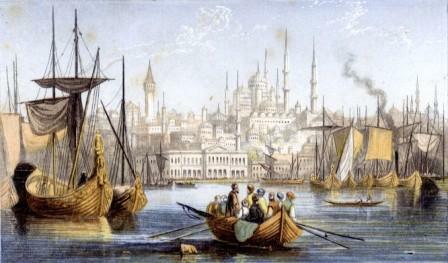 After the formation of the Republic of Turkey in 1923 the city was renamed Istanbul. Baxter Process Print, size 6.5 x 11.5 cm. This print is signed in the bottom plate margin, "J M Kronheim & Co., London." The Christian Wreath contained a total of 8 colour plates printed by Kronheim.